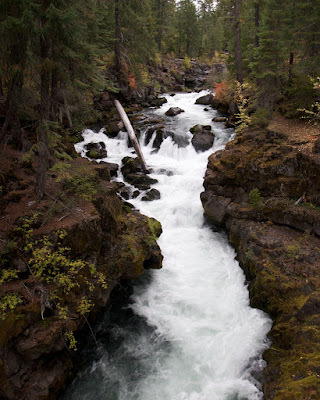 The Rogue River barreling through it's deep cut gorge. 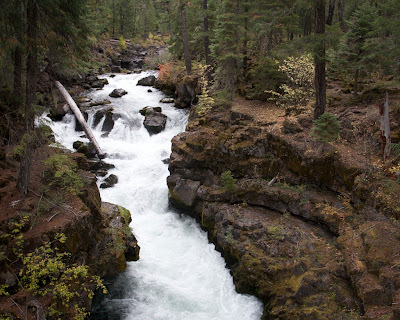 As the Rogue River slices its way across the state of Oregon towards the Pacific Ocean it crosses hundreds of miles, no single mile more exciting than the Natural Bridges near the headwaters. Basalt tubes constrict and funnel the raging river forcing it underground beneath old lava flows. Match the unique geology with brilliant fall foliage and you have the formula for a picturesque hike. The short trail takes only a few minutes to hike and was a perfect stretch after a long drive up the Rogue towards Crater Lake. The trail totals just over a mile round trip, but despite it's remarkable beauty and low difficulty it sees relatively minimal use. We arrived to find an empty parking lot and wide open trail. 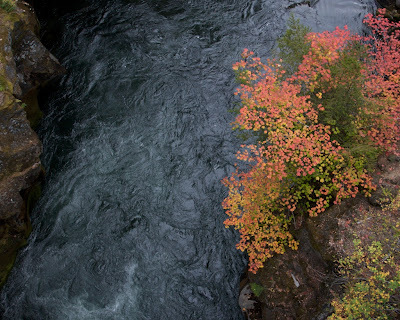 Fall Colors on the Rogue River. Shortly after stepping off the pavement and on to the trail we were immediately greeted by the sound of a rushing river flush with water from an overnight rainfall. The trail quickly crosses a wood bridge before continuing up the opposite bank of the river. Further up the trail the river dramatically spits out of the basalt tubes carving a deep cave into the side of the river channel. Fall on the Rogue River. The trail dead ends at an overlook above the natural bridge right as the river is sucked underground. After soaking in the natural beauty we took the same five-minute stroll back to our car and were on our way.